There are a ton of clear benefits to taking your lunch to work. It’s more sustainable, you are able to assess exactly what you’re putting in your body, you can save a ton of cash and most of the time it encourages you to be much healthier. And it doesn’t have to be such a hassle. Launching today on Kickstarter is the Prepd Pack, a lunchbox for those with an eye for design.. and their waistline. The modular culinary system has a distinctly bento box feel but instead of flimsy tupperware inserts, the “device” sports a slick-looking bamboo construction with a magnetic close, a few sturdy containers and magnetic cutlery that stays secure in the enclosure. I had the chance to check out a near-finished prototype of the Original Pack when I met with the Prepd team at CES, and it was clear there was a pretty serious amount of energy put into finessing the design and creating a well-built product that people wouldn’t be embarrassed to take to work with them. 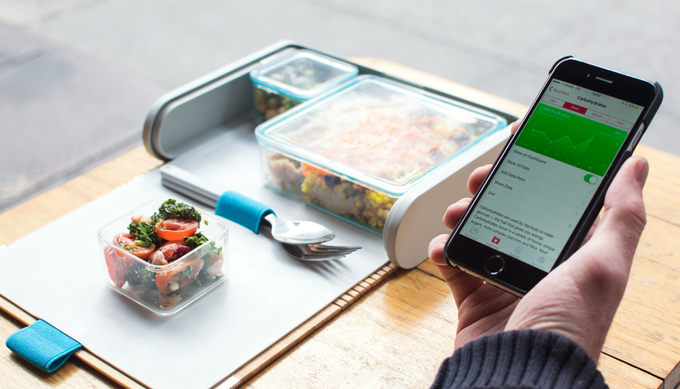 The product isn’t just a snazzy lunchbox. The team at Prepd is hoping to let people use the lunchbox as a way of tracking their nutrition. First off, the containers are purposefully somewhat conservative in their sizing to encourage proper portioning (i.e. you probably can’t fit a whole rotisserie chicken in them). The Prepd Pack also benefits from a companion app that incorporates recipes from professional nutritionists and chefs that will appropriately fill the containers. Additionally, the app boasts Health Kit on iOS integration so that you can view all of your health data within a single app. The premium lunchbox and its accompanying ecosystem is operating at a somewhat premium price with a starting price of $50 for backers. The team says they’re intending for the device to retail at $70. After launching just this morning the Prepd Pack has already blown through its $25,000 goal. The team is aiming to start shipping the units to early supporters in June.